Kat Redding is a force to be reckoned with. 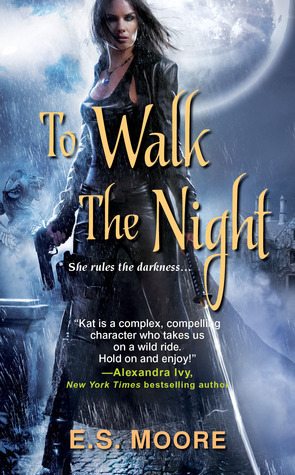 After being turned into a vampire against her will, she seeks vengeance by hunting monsters that go bump in the night. Kat is a strong female character that doesn't hesitate to shoot first and ask questions later. I wouldn't want to get on her bad side, luckily she only targets vampires and werewolves. She plots her way into vampire Houses and quickly exacts her revenge. Kat is very successful bringing down minor vampire Houses. She has built a reputation based on fear in her community and has earned the nickname Lady Death. A werewolf cult approaches Kat seeking assistance from a minor house that wants to take control of the Cult. I was honestly intrigued to see if she would be able to put aside her feelings towards werewolves and assist them. Kat isn't just a ruthless killer, the book shows her softer side when Ethan is brought into the story. She saved Ethan when he was a teen and has taken care of him since. I thought it was a nice addition to the book since it allowed me to know her character even better. When I first started this book, I instantly thought of Underworld and Blade. Kat hunts her own kind by herself with a samurai sword, and there are also werewolves that act as bodyguards in the book. While reading I was able to picture the fight scenes, most of which are intense and some quite graphic. There is zero romance in this book, which suited the book well because of its content. Overall To Walk the Night is a fast paced thrill ride that left me wanting to read more of E.S. Moore's work. Underworld & Blade. Love that combination.